Representatives of the private initiative and civil society gave their advice about the management system of public spaces that starting this year will renew 130 parks in Mérida, 18 of which will be rebuilt, while 26 will have new areas for children’s games and stands to protect themselves from the sun, and 83 will have exercise equipment. Four new parks will be built in Gran Santa Fe, Ciudad Caucel, Las Américas and Mulsay colonias. Carlos Erosa Burgos, president of the College of Civil Engineers of Yucatan, believes that the municipal work helps improve the city infrastructure and also offers more and better spaces for family and neighborhood coexistence. He made a comparison between the New York City Government Partnerships for Parks Program that has been operating since 1995, sponsored by the City Parks Foundation and the state park and garden agency. He said 4 relevant characteristics are included in the program, which are: a park inventory that shows its surface, an interactive system to search parks through the name of the street, their postal code or region and maps (as does the Merida City Council Geoportal), a program of recreational activities in the parks, and also the promotion of programs and ways of community participation. 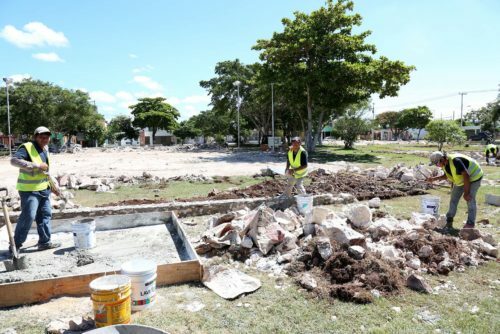 At the same time, Juan José Abraham Dáguer, President of the National Chamber of Commerce of Merida, indicated that the infrastructure works carried out by the Merida Council, such as the construction and improvement of parks, are positive as well as the improvements on health care. Luis Castillo Campos, president of Mexican Building Industry Chamber of Yucatan, stressed that investment in infrastructure such as parks and public spaces or roads is framed within the development of the Urban Development Program, which was carried out with much professionalism and the participation of all citizens, academic institutions, schools and chambers, which guarantee the success of the project.